For Toronto, Estrada threw 21 4-seamer strikes against Oakland who was a high minus VMI team coming back home from Colorado. Although the A's ended the game well, they only got one hit off those 21 strikes for a very poor 4.76 hit-to-strike ratio. Estrada was throwing that pitch at 89 mph, which means he had over one inch less lift than a closer to average fastball, so they should have hit better than they did if it weren't for their exposure to Colorado. Where Estrada really went wrong was that he threw four too many change-ups. Then the bull-pen came in and Oakland finished them off. 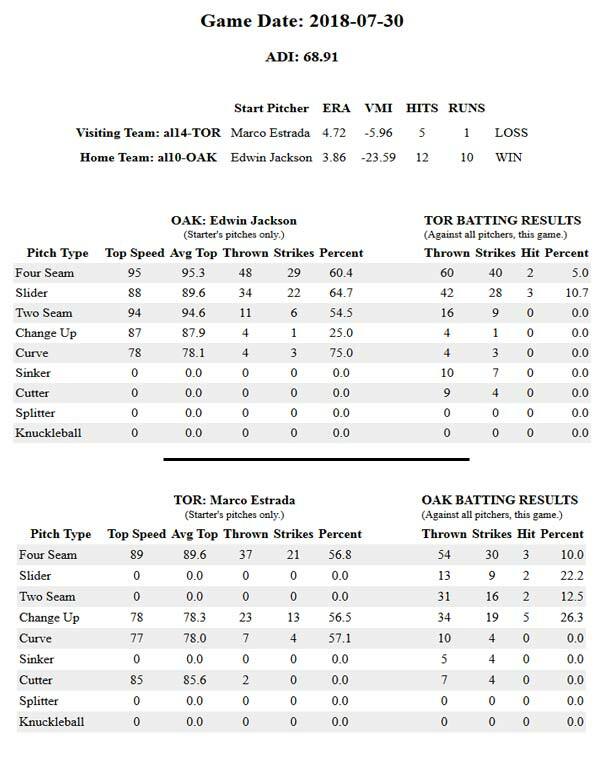 Toronto came to Oakland directly from Chicago and their VMI was calculated at minus 6 something, meaning their hitter's eye would be about 3/4 of an inch below a 95 mph four-seamer. True to the formula, Jackson threw 29 strikes to Toronto hitters at 95 mph and the Blue Jays got only 1 hit for a measley 3.45 hit/strike ratio. Of course, Toronto has been a poor hitting team all year, but they hit the downward breaking Slider quite well. Oakland did not throw any other pitch-types for more than 10 strikes, because they didn't need to. Toronto, at -5.96 VMI ended the game at a 5% 4-seamer, hit-to-strike ratio, but achieved a 10.7% ratio against the downward breaking 89 mph Slider.